This article is about decoding radio remote controls using Arduino or similar hardware and a cheap 433Mhz radio receiver (£2 on Ebay) and was written to serve a purpose: NONE of the existing libraries I could find out there managed to detect all of my radio remote controls. 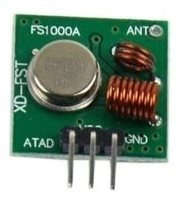 I’m interested in adding radio remote for mains control to my house control system which is basically an Atmel 1284 chip with Ethernet and radio network. 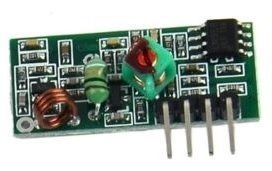 Although it is easy to make a remote switching unit that will be part of a network and control mains lights, it is overkill and it is also quite difficult to find dirt cheap mains to 5v supplies to go into one of the limited range of plug-in-the-wall project boxes along with a controller and a relay. With that in mind I started to look at the many mains switch remotes available out there. 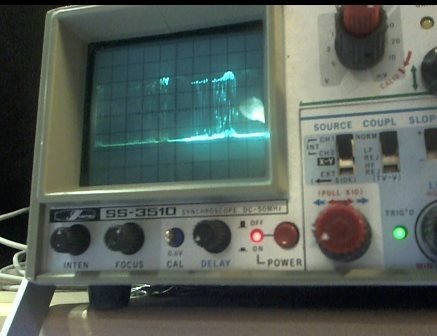 These generally work using simple 433Mhz radio receivers and accepting a code which could be almost any length but is normally somewhere between 10 bits and 50 bits.. the encoding techniques vary. Generally speaking these do not use any kind of “rotating” encoding for security and simply use a block of data, repeated as long as you hold the remote button. [a] the cheap controllers you find in the likes of B&Q use a single frequency which is EASILY blocked by other, similar transmitters. I found when experimenting with a radio link at 433Mhz that it was easily blocked just by holding a button down on a mains remote controller. [b] I found a nice cheap set of these plug-in-the-wall mains switches at ALDI recently, 3 remotes and a handset for £10 – what a bargain – but then looking at the fine print – you “train” them by turning them on and pressing a handset button within a few seconds – and that’s fine.. but, I thought, what about power cuts? Sure enough – you have to re-train them every time. What idiot came up with that brilliant idea? Going around the house re-training remotes every time the power fails? Surely not? But I tested them and that is how they work. They are boxed up ready to be returned – not “fit for purpose”. That is, to be fair, the first time I’ve come across this but if you order online – beware! Ok, so what could be difficult the handset lets out a 433Mhz modulated signal when a button is pressed – and the mains blocks pick up this signal, decode it and turn the plug on or off – so all you have to do is read the signal coming off the handset and use Arduino (or PIC etc) existing libraries to record and play back, right? Wrong – I had at least two handsets that use a code which was so long the existing learning libraries could not handle them AT ALL. Eventually after much reading and learning I decided to do my own thing. So, easy enough, (both the transmitter and receiver which I’ve linked to below have ground, power and signal leads – nothing else – the receiver appears to have two signal leads but they are connected together – you need only use either one) assuming the output of the simple receiver is LOW on standby, press the remote and look for the start bit – capture the length of each change of state until the end? Right? So – press the remote control button – THEN start scanning – and store the gaps between pulses – say, 300 of them. I did this with some REALLY simple code looking for high and low using the micros() function in Arduino (millis() is way too course) and keeping the code tight by simply storing the actual value of MICROS() in a long array.. ok not efficient but for temporary storage it works and I can get consistent results. I discovered that all the controls send repeated packages with a short absence of signal in-between. Given the noise issue, the first package often gets scrambled – the breakthrough came when analysing the stored values and realising the solution is to search for the first repeat – i.e. after the first BREAK –hence ignoring the first package – previous attempts to use that had yielded varying results at the start of the package. By the time the second package kicks in the AGC has adjusted and the noise has all but gone. So this would give me an output like this typical one from a handset. They vary of course in length (not from key to key in that case just the order of bits varies) but from handset manufacture to another model or manufacturer). As you can see from that link, the clock and data are encoded into the one signal. But for my purposes it’s really NOT important to either understand or use this knowledge. All that is necessary is to send that stream out – fixed width per pulse as per the original and if there are two identical adjascent values (ie 00 or 11, detected by longer and shorter pulses compared to a fixed value indicated by the first pulse) then obviously you simply send the status quo to the output bit for twice the length of time. But this uses up a lot of storage. Looking at various handsets I discovered the largest signal seems to be around 40 or so bits… I made up a 12-byte array and wrote a routine to bit-shift the entire array by one bit – hence allowing me to convert the string above to a more sensible set of bytes. In addition I added a byte at the start which represents the width of the basic pulse – as this could be as high as 1200us, I divided this by 10 to fit into a byte. In the example below you see 33 added to the start – ie 330us pulse width. On experimenting, that slight loss of accuracy seems unimportant and it saves a byte. And so for any given button – we now have 11 bytes (in this case) to encode it. I decided that was GOOD ENOUGH. A little routine to read from the end backwards, sending out pulses (or no pulse) for the duration specified in the first byte – VOILA I was accurately switching mains lamps on and off via my cheap transmitter. Most of the code is unique, some bits are variations on stuff I found on the web (thanks to all who’ve taken the time to put their ideas up on the web) – and is provided here UTTERLY without support – no comments on styling please – if you’re having trouble reading radio remotes for your purpose – I hope this is useful. Change input and output pins to suit your project – any pin will do, if you get nothing having pressed your remote then sent A to the board via the Arduino serial monitor, then try messing with INTER_CMS-MS and MIN_POS_WIDTH but I suggest not before you do that, you check with a scope that something is actually coming in. Clearly in any end gadget you make for your use, you’d not include the learning part or it’s huge TBUFF array. When I get a minute I plan to come up with a means to simply store the data in EEPROM and read from that… mind you – if you use a 1284 chip instead of the old 328, memory isn’t quite the problem. This is all suitable for short bursts to control stuff – don’t get any ideas about continuous home control signalling unless you can guarantee there are no other 433Mhz transmitters in use! I went down this route before realising it’s a non-starter and am now looking at the slightly more expensive frequency hopping chips for more sophisticated use – but if all you want to do is turn something on and off – this could be for you. // Byron reports 39us*10 for period - didn't work - so I put in 59 - works a treat.